After last month’s record cold of minus-23 degrees below zero — Friday morning might not seem so bad for some, but for others, especially little ones, bone-chilling days require lots of layers and heavy-duty winter gear. “Ugh. Not liking it,” Anna Steinke said. “I feel cold,” Ada Vento said. “You live in Wisconsin, so that’s just the way it is,” Kraig Herbrechtsmeier said. Although that may be just the way it is, it doesn’t mean a blustery day is any easier to bear. 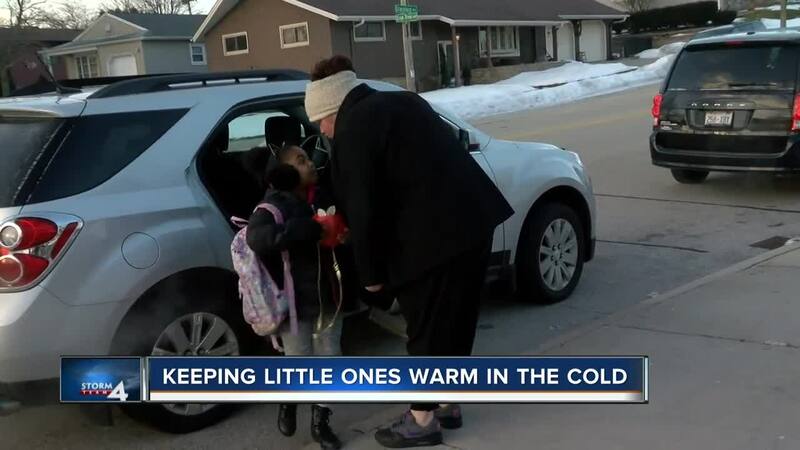 That’s why climbing out of the warmth of a cozy car, into the windy, cold conditions of a Wisconsin winter is tough for the little ones heading off to school wearing lots of layers, and it takes a toll on parents, too. “It takes a lot of time (to get them ready for school) because … I have two kids and they have to put their snow pants on, their coat on and everything like that,” Vento said. “I think the hardest thing is for our kids having to wait outside for the bus or walk to school,” Steinke said. "This is the second time this month we’ve had to brave a single-digit temperature day, and while bundling up helps combat the cold — thinking warm thoughts goes a long way, too. “We can handle (this weather) man, we can handle it,” Herbrechtsmeier said.